She told me that The Domain Expeditionary Force first entered into the Milky Way galaxy very recently — only about 10,000 years ago. Their first action was to conquer the home planets of the “Old Empire” (this is not the official name, but a nick-name given to the conquered civilization by The Domain Forces) that served as the seat of central government for this galaxy, and other adjoining regions of space. These planets are located in the star systems in the tail of the Big Dipper constellation. [i] (Footnote) She did not mention which stars, exactly. 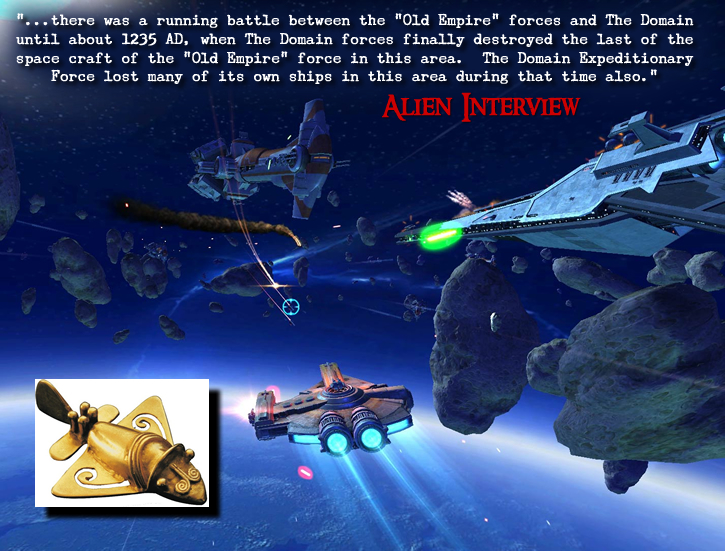 According to Airl, there was a running battle between the “Old Empire” forces and The Domain until about 1235 AD, when The Domain forces finally destroyed the last of the space craft of the “Old Empire” force in this area. The Domain Expeditionary Force lost many of its own ships in this area during that time also. 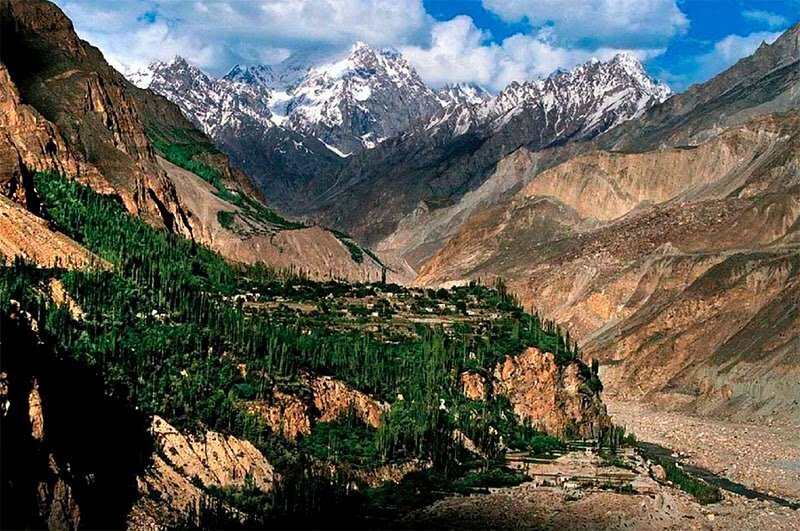 About 1,000 years later the “Old Empire” base was discovered by accident in the spring of 1914 AD. The discovery was made when the body of the Archduke of Austria, [ii] (Footnote) was “taken over” by an officer of The Domain Expeditionary Force. This officer, who was stationed in the asteroid belt, was sent to Earth on a routine mission to gather reconnaissance. Eventually The Domain discovered that a wide area of space is monitored by an “electronic force field” [iii] (Footnote) which controls all of the IS-BEs in this end of the galaxy, including Earth. The electronic force screen is designed to detect IS-BEs and prevent them from leaving the area. On Earth this “therapy” uses only a few hundred volts of electricity. However, the electrical voltage [v] (Footnote) used by the “Old Empire” operation against IS-BEs is on the order of magnitude of billions of volts! This tremendous shock completely wipes out all the memory of the IS-BE. The memory erasure is not just for one life or one body. It wipes out all of the accumulated experiences of a nearly infinite past, as well as the identity of the IS-BE! After the shock a series of post hypnotic suggestions [vi] (Footnote) are used to install false memories, and a false time orientation in each IS-BE. This includes the command to “return” to the base after the body dies, so that the same kind of shock and hypnosis can be done again, and again, again — forever. The hypnotic command also tells the “patient” to forget to remember. What The Domain learned from the experience of this officer is that the “Old Empire” has been using Earth as a “prison planet” for a very long time — exactly how long is unknown — perhaps millions of years. So, when the body of the IS-BE dies they depart from the body. They are detected by the “force screen”, they are captured and “ordered” by hypnotic command to “return to the light”. The idea of “heaven” and the “afterlife” are part of the hypnotic suggestion — a part of the treachery that makes the whole mechanism work. Any undesirable IS-BEs who are sentenced to Earth were classified as “untouchable” [vii] (Footnote) by the “Old Empire”. This included anyone that the “Old Empire” judged to be criminals who are too vicious to be reformed or subdued, as well as other criminals such as sexual perverts, or beings unwilling to do any productive work. An “untouchable” classification of IS-BEs also includes a wide variety of “political prisoners” [viii] (Footnote). This includes IS-BEs who are considered to be noncompliant “free thinkers” or “revolutionaries” who make trouble for the governments of the various planets of the “Old Empire”. Of course, anyone with a previous military record against the “Old Empire” is also shipped off to Earth. Anyone who is not willing or able to submit to mindless economic, political and religious servitude as a tax-paying worker in the class system of the “Old Empire” are “untouchable” and sentenced to receive memory wipe-out and permanent imprisonment on Earth. The net result is that an IS-BE is unable to escape because they can’t remember who they are, where they came from, where they are. They have been hypnotized to think they are someone, something, sometime, and somewhere other than where they really are. The Domain officer who was “assassinated” while in the body of Archduke of Austria was, likewise, captured by the “Old Empire” force. Because this particular officer was a high powered IS-BE, compared to most, he was taken away to a secret “Old Empire” base under the surface of the planet Mars. They put him into a special electronic prison cell and held him there. Although the military base of the “Old Empire” was destroyed, unfortunately, much of the vast machinery of the IS-BE force screens, the electroshock / amnesia / hypnosis machinery continues to function in other undiscovered locations right up to the present moment. The main base or control center for this “mind control prison” [xi] (Footnote) operation has never been found. So, the influences of this base, or bases, are still in effect. The Domain has observed that since the “Old Empire” space forces were destroyed there is no one left to actively prevent other planetary systems from bringing their own “untouchable” IS-BEs to Earth from all over this galaxy, and from other galaxies nearby. Therefore, Earth has become a universal dumping ground for this entire region of space. This, in part, explains the very unusual mix of races, cultures, languages, moral codes, religious and political influences among the IS-BE population on Earth. The number and variety of heterogeneous societies on Earth are extremely unusual on a normal planet. Most “Sun Type 12, Class 7” planets are inhabited by only one humanoid body type or race, if any. In addition, most of the ancient civilizations of Earth, and many of the events of Earth have been heavily influenced by the hidden, hypnotic operation of the “Old Empire” base. So far, no one has figured out exactly where and how this operation is run, or by whom because it is so heavily protected by screens and traps. Furthermore, there has been no operation undertaken to seek out, discover and destroy the vast and ancient network of electronics machinery that create the IS-BE force screens at this end of the galaxy. Until this has been done, we are not able to prevent or interrupt the electric shock operation, hypnosis and remote thought control [xii] (Footnote) of the “Old Empire” prison planet. “In the Indian caste system, a Dalit, often called an untouchable, or an outcaste, is a person who according to traditional Hindu belief does not have any “varnas”. Varna refers to the Hindu belief that most humans were supposedly created from different parts of the body of the divinity Purusha. The part from which a varna was supposedly created defines a person’s social status with regard to issues such as whom they may marry and which professions they may hold. Dalits fall outside the varnas system and have historically been prevented from doing any but the most menial jobs. (However, a distinction must be made between lower-caste people and Pariahs.) Included are leather-workers (called chamar), carcass handlers (called mahar),poor farmers and landless labourers, night soil scavengers (called bhangi or chura), street handicrafters, folk artists, street cleaners, dhobi, etc. “Human rights abuses against these people, known as Dalits, are legion. A random sampling of headlines in mainstream Indian newspapers tells their story: “Dalit boy beaten to death for plucking flowers”; “Dalit tortured by cops for three days”; “Dalit ‘witch’ paraded naked in Bihar”; “Dalit killed in lock-up at Kurnool”; “7 Dalits burnt alive in caste clash”; “5 Dalits lynched in Haryana”; “Dalit woman gang-raped, paraded naked”; “Police egged on mob to lynch Dalits”. “A political prisoner is someone held in prison or otherwise detained, perhaps under house arrest, for his/her involvement in political activity. political prisoners are arrested and tried with a veneer of legality, where false criminal charges, manufactured evidence, and unfair trials are used to disguise the fact that an individual is a political prisoner. This is common in situations which may otherwise be decried nationally and internationally as a human rights violation and suppression of a political dissident. A political prisoner can also be someone that has been denied bail unfairly, denied parole when it would reasonably have been given to a prisoner charged with a comparable crime, or special powers may be invoked by the judiciary. “The Honorverse is the semi-official name for the setting of a military science fiction series of stories by David Weber featuring Honor Harrington, the Nelsonesque heroine in a series reminiscent of C. S. Forester’s Horatio Hornblower book series. The books are popular in the United States and new releases regularly make The New York Times Best Seller list. This statement was made by Airl in 1947. The following photographs of this area were not taken by NASA satellites in the 1970s! “In addition, a team of scientists from the United States Geological Survey reported at the recent annual Lunar and Planetary Science Conference in Houston, Texas, that images taken by NASA’s Mars-orbiting spacecraft Mars Odyssey show what appear to be cave entrances where primitive life forms – “past or present microbial life” – could have been sheltered, and where water could exist in liquid form. “Mind control (or “brainwashing”) refers to a broad range of psychological tactics able to subvert an individual’s control of his own thinking, behavior, emotions, or decisions. The concept is closely related to hypnosis, but differs in practical approach. William Sargant connected Pavlov’s findings (the Russian researcher who experimented on stimulus-response mechanism with dogs) to the ways people learned and internalized belief systems. Conditioned behavior patterns could be changed by stimulated stresses beyond a dog’s capacity for response, in essence causing a breakdown. This could also be caused by intense signals, longer than normal waiting periods, rotating positive and negative signals and changing a dog’s physical condition, as through illness. Depending on the dog’s initial personality, this could possibly cause a new belief system to be held tenaciously. Sargant also connected Pavlov’s findings to the mechanisms of brain-washing…. Psychologist Margaret Singer describes six conditions which would create an atmosphere in which thought reform is possible. Singer states that these conditions involve no need for physical coercion or violence. Keep the victim unaware of what is going on and how he is being changed a step at a time. Control the victim’s social and/or physical environment; especially control the victim’s time. Systematically create a sense of powerlessness in the victim. This is accomplished by getting victims away from their normal social support group for a period of time and into an environment where the majority of people are already group members. The victims serve as models of the attitudes and behaviors of the group and speak an in-group language. Strip victims of their main occupation (quit jobs, drop out of school) or source of income or have them turn over their income (or the majority of) to the group. Once stripped of your usual support network, your confidence in your own perception erodes. As group attacks your previous worldview, it causes you distress and inner confusion; yet you are not allowed to speak about this confusion or object to it — leadership suppresses questions and counters resistance. This process is sped up if you are kept tired. Manipulate a system of rewards, punishments and experiences in such a way as to inhibit behavior that reflects the victim’s former social identity. Manipulation of experiences can be accomplished through various methods of trance induction, including leaders using such techniques as paced speaking patterns, guided imagery, chanting, long prayer sessions or lectures, and lengthy meditation sessions. Your old beliefs and patterns of behavior are defined as irrelevant or evil. Leadership wants these old patterns eliminated, so the victims must suppress them. Victims get positive feedback for conforming to the group’s beliefs and behaviors and negative feedback for old beliefs and behavior. Manipulate a system of rewards, punishments, and experiences in order to promote learning the group’s ideology or belief system and group-approved behaviors. Good behavior, demonstrating an understanding and acceptance of the group’s beliefs, and compliance are rewarded while questioning, expressing doubts or criticizing are met with disapproval, redress and possible rejection. If one expresses a question, he or she is made to feel that there is something inherently wrong with them to be questioning. 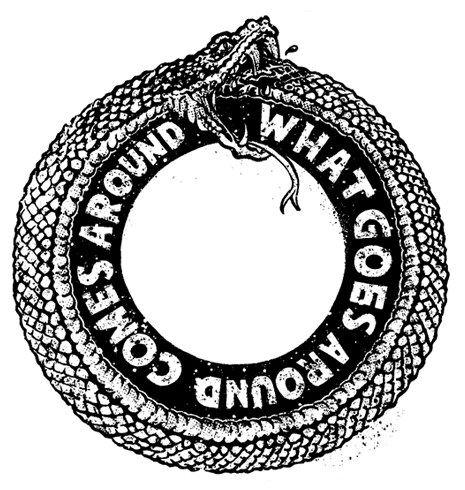 The only feedback victims get is from the group, they become totally dependent upon the rewards given by those who control the environment. Victims must learn varying amounts of new information about the beliefs of the group and the behaviors expected by the group. The more complicated and filled with contradictions the new system is and the more difficult it is to learn, the more effective the conversion process will be. Esteem and affection from peers is very important to new recruits. Approval comes from having the new victim’s behaviors and thought patterns conform to the models (victims). Victims’ relationship with peers is threatened whenever they fail to learn or display new behaviors. Over time, the easy solution to the insecurity generated by the difficulties of learning the new system is to inhibit any display of doubts — new recruits simply acquiesce, affirm and act as if they do understand and accept the new ideology. Put forth a closed system of logic and an authoritarian structure that permits no feedback and refuses to be modified except by leadership approval or executive order. The group has a top-down, pyramid structure. The leaders must have verbal ways of never losing. Victims are not allowed to question, criticize or complain — if they do, the leaders allege that the victim is defective — not the organization or the beliefs. The individual is always wrong — the system, its leaders and its belief are always right. A contemporary view of mind control sees it as an intensified and persistent use of well researched social psychology principles like compliance, conformity, persuasion, dissonance, reactance, framing or emotional manipulation. “I conceive of mind control as a phenomena encompassing all the ways in which personal, social and institutional forces are exerted to induce compliance, conformity, belief, attitude, and value change in others. EDITOR’S NOTE: If “hypersonic sound” (see reference below) can already be used on Earth, which has been using electricity for only 150 years, imagine a technology that has been refined over millions of years, that could transmit thoughts that are precisely targeted to an individual person across millions of miles of space. In 2008, there is a chance that the voice inside your head may be trying to sell you something. Advertisers are using a new acoustic technology to project advertising slogans directly into your head. And not everyone is happy about the aural intrusion. In fact, the space between your ears may be the newest battleground in the conflict between privacy and technology. The technique is called hypersonic sound and it was created by inventor Woody Norris. Hypersonic sound (HSS) projection enables sound to be directed precisely to one individual without any spillover. In tandem with an ultrasonic emitter and a signal processor/amplifier, HSS projects a column of modulated ultrasonic frequencies into the air. The ultrasonic frequencies are inaudible by themselves, but the interaction of the frequencies with the air create sounds that can be heard by anyone inside the column. Hypersonic sound can direct sound as precisely as a laser beam can direct light. One only needs to be standing in the path of an HSS beam in order to hear the sound. However, the sensation to those hearing is that the sound is being projected from inside their skull. Pretty cool, thinks inventor Norris. Or pretty creepy if you don’t know what’s going on. It is already being done from a billboard on Prince Street in New York City. Advertising for a television show called “Paranormal State,” which airs on the Arts and Entertainment Network (A&E), has been sent through HSS to unsuspecting pedestrians who trigger a sensor as they stroll by. The sound that is emitted can be heard only by them. “When the Domain Force brought the Vedic Hymns [i] (Footnote) to the Himalayas region 8,200 years ago, some human societies already existed. The Aryan people invaded and conquered India [ii] (Footnote) , bringing the Vedic Hymns [iii] (Footnote) to the area. The Vedas were learned by them, memorized and carried forward verbally for 7,000 years before being committed to written form. During that span of time one of the officers of The Domain Expeditionary Force was incarnated on Earth as “Vishnu” [iv] (Footnote). He is described many times in the Rig-Veda. He is still considered to be a god by the Hindus. Vishnu fought in the religious wars against the “Old Empire” forces. He is a very able and aggressive IS-BE as well as a highly effective officer, who has since been reassigned to other duties in The Domain. This entire episode was orchestrated as an attack and revolt against the Egyptian pantheon installed by “Old Empire” administrators. The conflict was intended to help free humankind from implanted elements of the false civilization that focused attention on many “gods” and superstitious ritual worship demanded by the priests who “managed” them. It is all part of the mental manipulation by the “Old Empire” to hide their criminal actions against the IS-BEs on Earth. The individual has no power. Only the gods have power. And, the gods are a contrivance of the priests who intercede between men and the gods they serve. 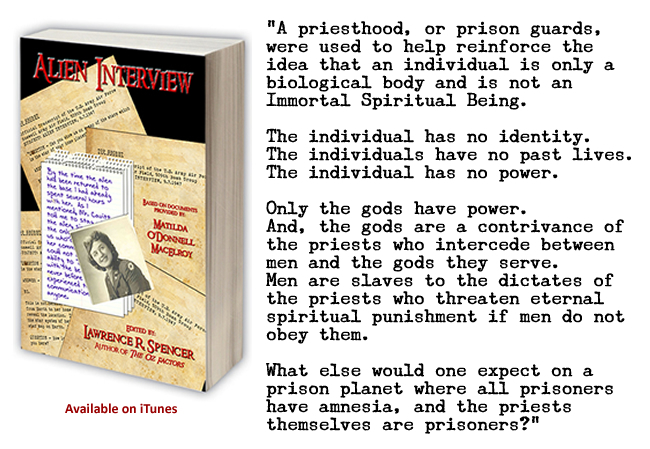 Men are slaves to the dictates of the priests who threaten eternal spiritual punishment if men do not obey them. The Vedas are very exhaustive scriptures. Each veda contains several sections and thousands of hymns. Some of the Vedic hymns, especially the hymns of the Rig veda, are considered to be at least 6000-8000 years old. The Vedas are believed to be revealed scriptures, because they are considered to be divine in origin. Since they were not written by any human beings but were only heard in deep meditative states, they are commonly referred a “those that were heard”. “A time is envisioned when the world was not, only a watery chaos (the dark, “indistinguishable sea”) and a warm cosmic breath, which could give an impetus of life. Notice how thought gives rise to desire (when something is thought of it can then be desired) and desire links non-being to being (we desire what is not but then try to bring it about that it is). Yet the whole process is shrouded in mystery. Where do the gods fit in this creation scheme? “The Vedic term arya– in its earliest attestations has a meaning of “stranger”, but “stranger” in the sense of “potential guest”. The Sanskrit lexicon defines Arya as mahākula kulīnārya “being of a noble family”, sabhya “having gentle or refined behavior and demeanor”, sajjana “being well-born and respectable”, and sādhava “being virtuous, honourable, or righteous”. Arya, is a title of honor and respect given to certain people for noble behavior. The Aryan race was a term used in the early 20th century by European racial theorists who believed strongly in the division of humanity into biologically distinct races with differing characteristics. Such writers believed that the Proto-Indo-Europeans constituted a specific race that had expanded across parts of Europe, Iran and small parts of northern India. This usage tends to merge the Sanskrit meaning of “noble” or “elevated” with the idea of distinctive behavioral and ancestral ethnicity marked by language distribution. “Vishnu is the All-Pervading essence of all beings, the master of and beyond the past, present and future, the creator and destroyer of all existences, one who supports, sustains and governs the Universe and originates and develops all elements within. In the Rigveda, Vishnu is mentioned 93 times. The traditional Sanskrit explanation of the name Viṣṇu involves the root viś, meaning “to settle, to enter”, or “to pervade”, and a suffix nu, translating to approximately “the All-Pervading One”. “Reincarnation literally “to be made flesh again”, is a doctrine or metaphysical belief that some essential part of a living being (in some variations only human beings) survives death to be reborn in a new body. This essential part is often referred to as the spirit or soul, the “higher” or “true” self, “divine spark”, or “I”. According to such beliefs, a new personality is developed during each life in the physical world, but some part of the self remains constant throughout the successive lives. Belief in reincarnation is an ancient phenomenon. This doctrine is a central tenet within the majority of Indian religious traditions, such as Hinduism (including Yoga, Vaishnavism, and Shaivism), Jainism, and Sikhism. The idea was also entertained by some Ancient Greek philosophers. Many modern Pagans also believe in reincarnation as do some New Age movements, along with followers of Spiritism, practitioners of certain African traditions, and students of esoteric philosophies such as Kabbalah, Sufism and Gnostic and Esoteric Christianity. The Buddhist concept of Rebirth although often referred to as reincarnation differs significantly from the Hindu-based traditions and New Age movements in that there is no “self” (or eternal soul) to reincarnate. During recent decades, a significant minority of people in the West have developed a belief in reincarnation. Notable exceptions include Henry Ford and General George Patton. General George S. Patton was a staunch believer in reincarnation and, along with many other members of his family, often claimed to have seen vivid, lifelike visions of his ancestors. In particular, Patton believed he was a reincarnation of Carthaginian General Hannibal. The most detailed collections of personal reports in favor of reincarnation have been published by Professor Ian Stevenson, from the University of Virginia, in books such as Twenty Cases Suggestive of Reincarnation. Stevenson spent over 40 years devoted to the study of children who have apparently spoken about a past life. In each case, Professor Stevenson methodically documented the child’s statements. Then he identified the deceased person the child allegedly identified with, and verified the facts of the deceased person’s life that matched the child’s memory. He also matched birthmarks and birth defects to wounds and scars on the deceased, verified by medical records such as autopsy photographs. In a fairly typical case, a boy in Beirut spoke of being a 25-year-old mechanic, thrown to his death from a speeding car on a beach road. According to multiple witnesses, the boy provided the name of the driver, the exact location of the crash, the names of the mechanic’s sisters and parents and cousins, and the people he went hunting with — all of which turned out to match the life of a man who had died several years before the boy was born, and who had no apparent connection to the boy’s family.